As the French Lick Resort trolley begins chugging up a steep hill, reminding me more of San Francisco than what I’d expect in Indiana, my curiosity kicks into high-gear. Anticipation builds as we make the climb and I silently wonder, what’s this Pete Dye Course all about? That question is quickly answered as the majestic golf course appears, and we continue the climb to the perched mansion clubhouse atop the hill. 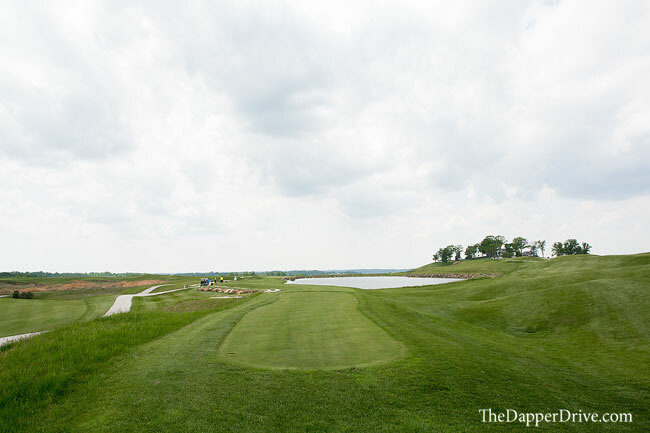 The view is breathtaking, and I can’t wait to see what this top 20 public course has to offer. In my prior post, I noted that there are few golf resorts that boast two truly different golf courses. The French Lick Resort happens to be one of them. 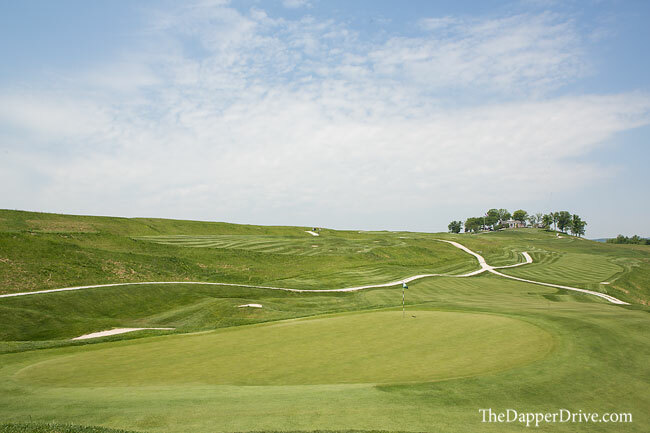 While the century old Donald Ross Course (read about that here: UGRT – Round 26: The Donald Ross Course) presents a classic layout through rolling hills, The Pete Dye Course offers an uber pristine, modern design on a dramatic piece of property. Let’s take a closer look. 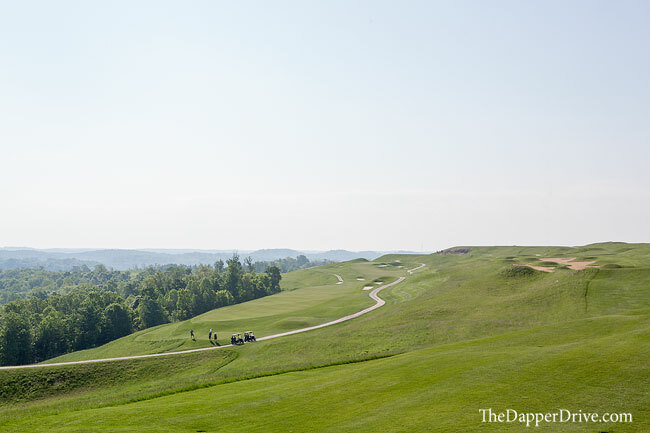 The Pete Dye Course sits atop one of the highest elevations in Indiana, so it’s no surprise it offers breathtaking views throughout. 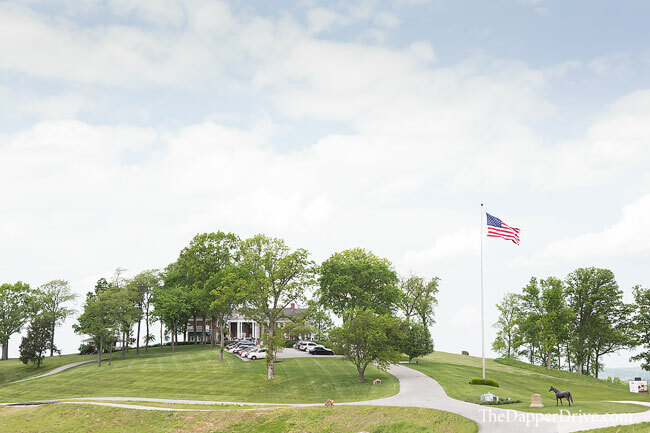 The clubhouse (former mansion of once resort owner Thomas Taggart) is the centerpiece of the property, with the golf course surrounding on the land below. 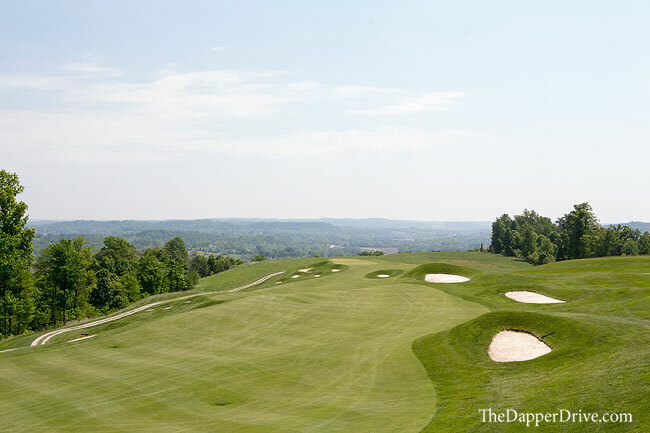 When Pete Dye was originally contracted to build the golf course, he first concluded that the slopes were too severe and terrain too rugged to build a course. However, persistence paid off as he eventually crafted today’s incredible design. 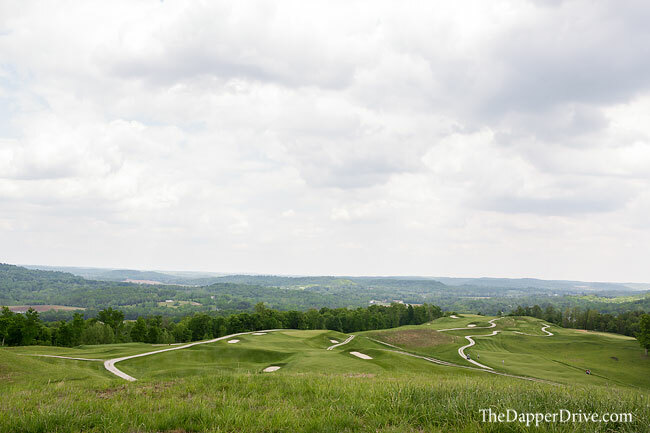 The golf course itself is ridden with Pete Dye signature characteristics. 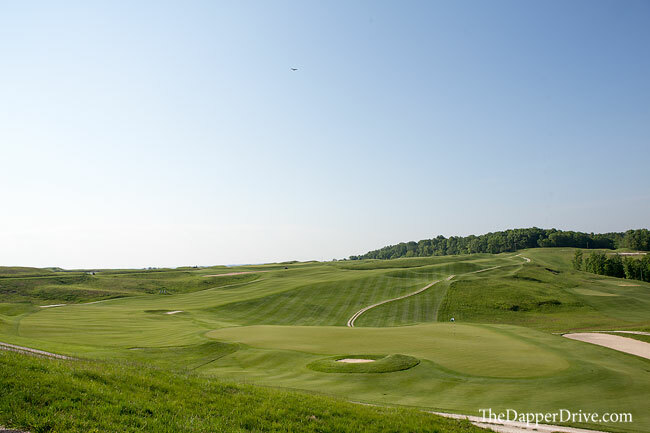 For starters, it’s one of the longest courses in America, measuring in at 8,100 yards from the championship tees! Yes, you read that right. There are some beastly holes from those tees, including the 301 yard par 3 16th. Few dare to take it all the way back there, and I’d certainly suggest choosing a more ‘friendly’ set of tees to play from. I played the next set-up at 7,400 yards, and it was all I could handle. 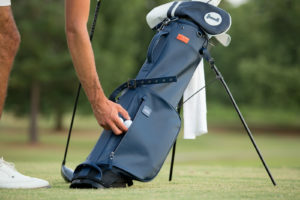 Once you get past the initial shock of the sheer distance, there are 5 other key elements you’ll discover throughout your round. 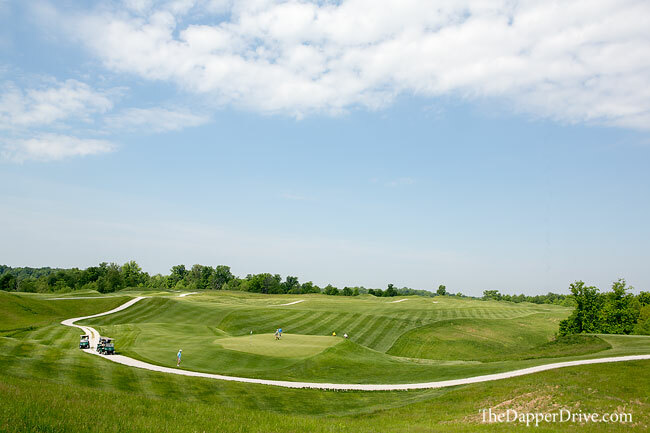 There are very few holes that don’t provide sweeping views of the Indiana countryside and Hoosier National Forest. At some points, you’ll experience unencumbered views for 40+ miles. Pretty dang cool. 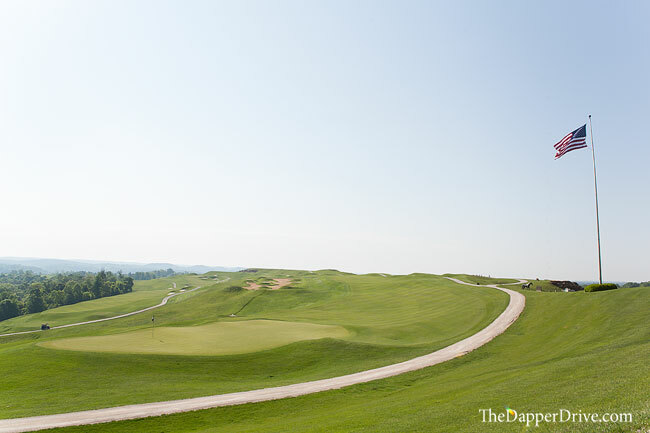 Hole 6: While the tee shot takes you slightly uphill, the descending approach to an infinity green is unbelievable. Stand on the crest of the hill just short of the fairway bunkers for a magazine worthy image, and do the same from the back of the green. 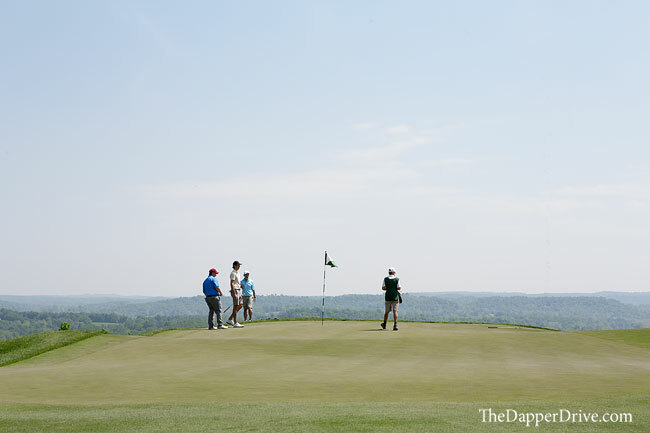 Hole 9: The view from the tee is great, but be sure to take a look from behind the green, where holes 6, 7 and 9 offer a great photographic moment. Hole 11: Climb to the white tee box for a great view of holes 11-13 in the foreground, and the countryside in the distance. 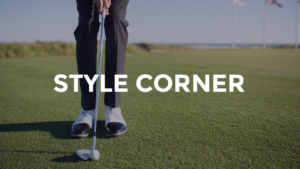 Almost every golf shot on The Dye Course will require some calculating, as those same elevation changes that create impeccable views also can wreak havoc on club selection. If you’re unsure, take the club that you know won’t get you into too much trouble. 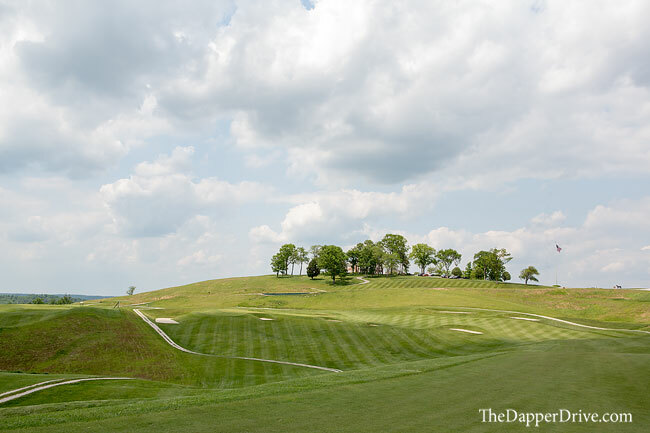 I’ve come to expect some unique things from Pete Dye courses, and he doesn’t disappoint at French Lick. There are plenty of interesting bunker complexes throughout the design, most positioned perfectly in landing areas and guarding greens. 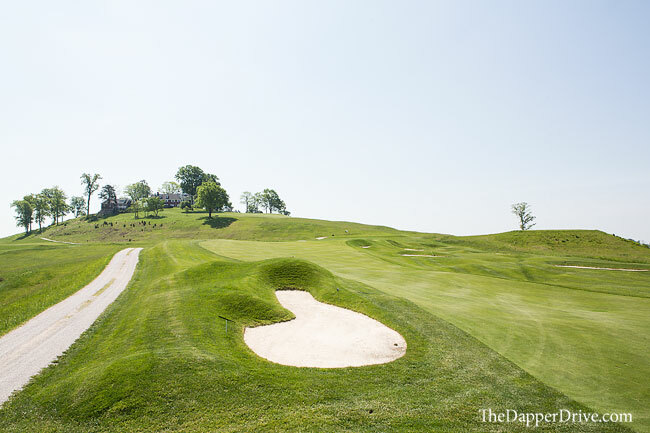 Lining the right side of the 2nd fairway, and behind the 7th green, golfers are faced with numerous “volcano bunkers,” named after their resemblance to a volcano. 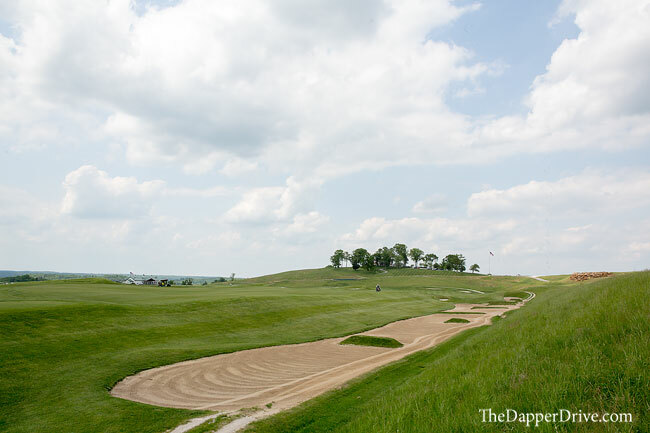 Small, cylinder-style mounds topped with tiny pot bunkers make for an interesting visual aspect, but also a tough test should you find these. Avoid at all costs! The 9th fairway features a waste bunker that’s peppered with actual bunkers (surrounded by small areas of grass), while the right side of the 18th presents another large waste bunker with grassy ‘church-pew’ style mounds. 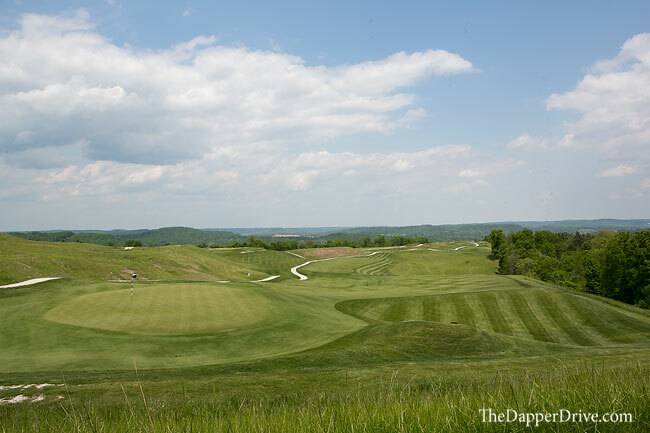 Pete Dye loves to play with the golfer’s mind, and he does a great job of that at French Lick. Deep grass filled valleys, water hazards, and bunkers flank every fairway out here. And while there is some room to miss, many pinch tighter at common landing zones. If you’re objective is to score, play to the fatter portions, even if that means slightly longer approaches. Otherwise, grab the big stick and swing away! During our visit in mid-May, the greens were in fantastic condition. Quick pace and true rolls characterized these often dramatically sloped greens. 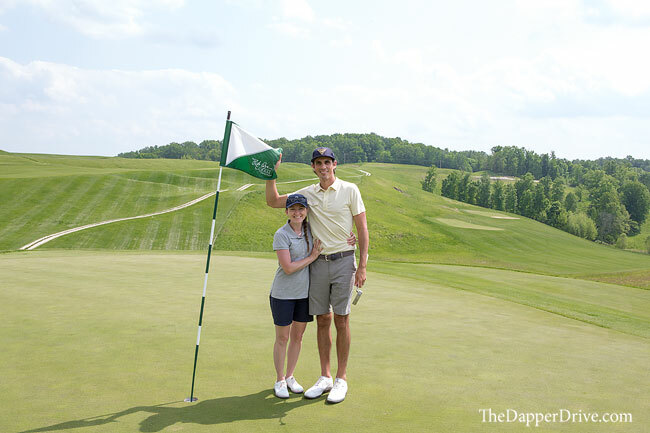 Fortunately, you’ll be accompanied by a fore-caddy during your round, who is certain to help you read these heavily sloped greens. Our caddy – who goes by “Roadrunner” – had 15-years of Tour experience and definitely knew his way around the course! I could honestly make a case for just about every hole out here, but I’ll narrow it down to three favorites. Coincidentally, they’re all par 5s. Hole 3 – 641 yard par 5: The lengthy par 5 has a narrow fairway running the length of the hole, with the second half a hard dogleg left. 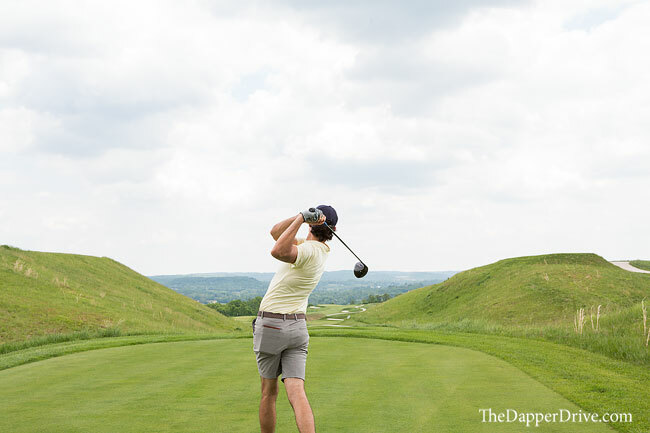 However, a well placed drive will give you a shot at the green in two, as it plays downhill and you can cut off the dogleg (which is just a grass valley below). It presents a great view of the clubhouse as well, perched on the hill above. Hole 14 – 575 yard par 5: Playing straight up the hill and often into the wind, this is a 3-shot hole for even the longest hitters. 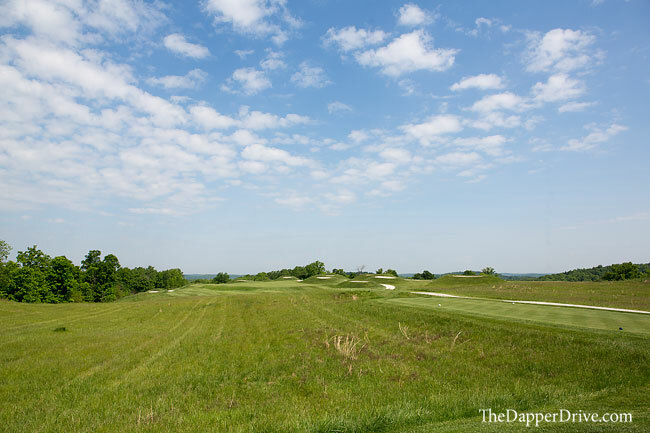 The layup shot provides options, with a lower fairway to the right and a second, elevated upper fairway to the left. The left provides a better look at the green for your third, but makes for a tougher layup shot. Options! Also, the view from the green is gorgeous. 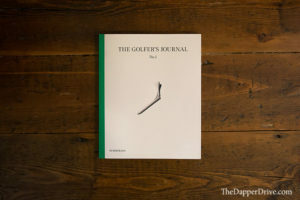 Hole 18 – 657 yard par 5: I love an interesting par 5 to end a round. Avoid the church-pew style waste bunker down the right, and (from the right set of tees) you may find yourself with a chance to go for this green in two. Choosing to do so means a forced carry over a huge grass-filled valley to a well-guarded green. With the clubhouse looming in the distance, it’s a great way to finish the round. 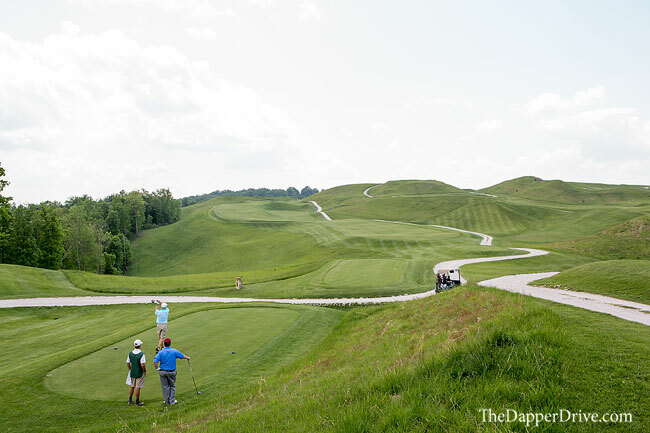 The Pete Dye Course at French Lick Resort is the real deal. Its a visually stunning golf course, that provides plenty of challenge and interesting hole designs. 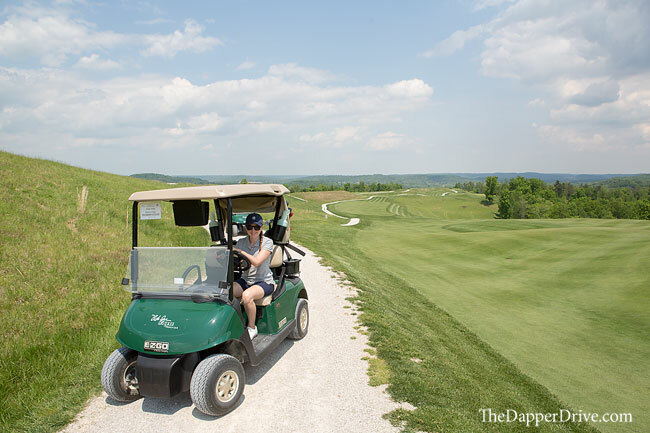 With resort accommodations, endless amenities, and two championship golf venues, I’d recommend considering French Lick for a long-weekend getaway. 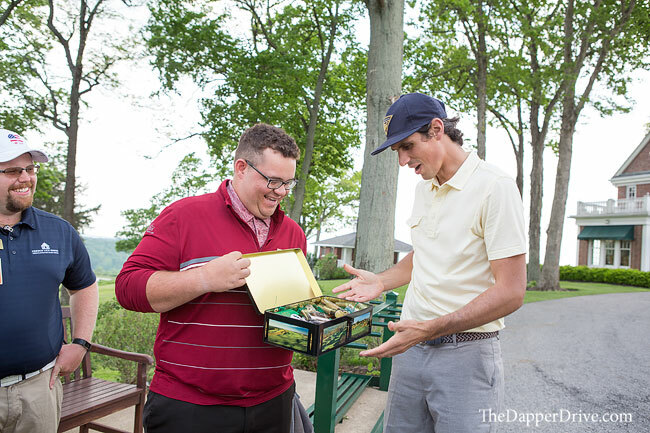 And lastly, if you book a 3-or-4-some, The Dye Course will present your group with a special gift: 1 bottle of bourbon, 4 shot glasses, and 4 cigars. Not a bad way to say thanks for playing!